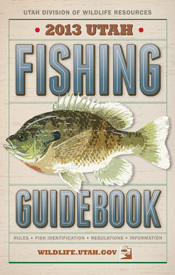 As the weather warms up and lakes begin to thaw, your Troop may be making plans to go fishing in the next few months. 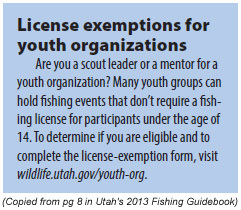 Did you know there’s a license exemption for youth organizations in Utah? My troop discovered this as they planned an ice fishing outing on Rockport Reservoir back in February. I knew kids over 12 needed a license and thought we’d each have to pay the $7 for a 1-day license. However, one of our Patrol Leaders found this tidbit of info after volunteering to research the regulations in our state. Nice job PL! 23-19-14.5 Persons participating in youth organization activity authorized to fish without license. promotes character building through outdoor activities. that the activity is officially sanctioned by the youth organization. (a) The adult leader shall instruct the members on fishing statutes and rules. adult leader in complying with Subsection (3)(a). By following the procedures and requirements of Tile 63, Chapter 46a, Utah Administrative Rulemaking Act, the Wildlife Board shall adopt rules specifying the form of the official documentation required by Subsection (2)(C)(ii). Here’s a copy of the exemption form a Scoutmaster must have in his possession during the troop’s fishing event. It also might be a good idea to check the current year’s Utah Fishing Guidebook to make sure the rules haven’t changed since 2013. 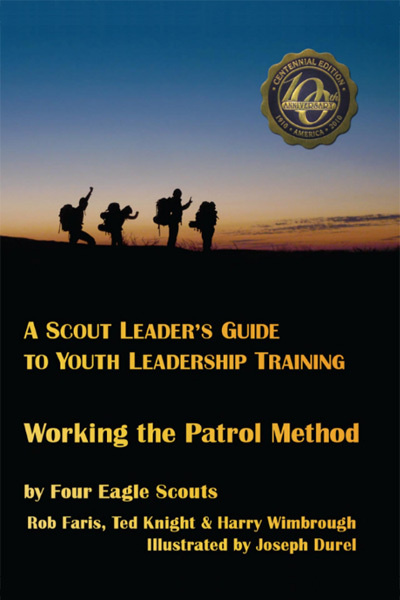 This entry was posted in Scout Outings, Wasatch Front and tagged 23-19-14.5, boy scouts, dwr, exemption, fishing, guidebook, license, monthly outings, scout outing, scouting, senate bill 59, utah, youth organization. Bookmark the permalink. Effective May 2015, youth ages 12-15 can fish without a license. One adult must have a license.